Many attribute the big jump in 2018 Obamacare premiums to the Trump Administration’s decision to terminate government payments to insurance companies, known as cost-sharing-reduction (CSR) subsidies. Galen Institute Senior Fellow Doug Badger reports in a paper published today by The Heritage Foundation that premiums increased by double digits even for Obamacare policies that were not affected by the CSR cutoff. He further finds that restoring CSR payments in 2018 will not dampen these premium increases. 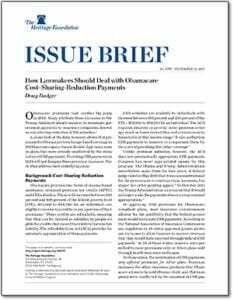 Trying to rush CSR and reinsurance payments out the door for 2018, as some in Congress are considering, will result in wasteful and unnecessary spending, and will be more likely to create confusion than to produce the predictability lawmakers seek. Here is Doug‘s paper, published by Heritage’s Domestic Policy Studies department, providing more detail to help Congress in making its decisions on this issue.